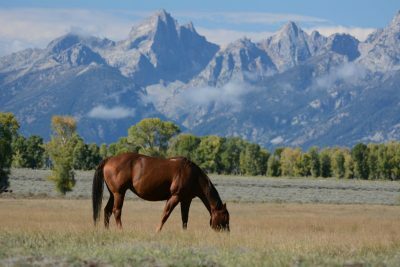 Grand County is known for their spectacular views and outdoor lifestyle, so it is no surprise that it is a definite go-to destination for horse lovers. You can find activities to suite anyone from first-time riders to the advanced rider, and for those who just want to get in on some activities without riding, Grand County offers a true Wild West experience with their summer rodeos! Rodeos began more than 100 years ago as weekend recreation on working ranches. Today, three rodeos in Grand County feature the best local amateur and professional contestants in the traditional cowboy skills of riding and roping. The Flying Heels Rodeo, located at the Flying Heels Arena, just south of Granby on US Hwy 40 across from City Market. For the lil’ cowpokes, they offer a junior rodeo as well! In its 35th season, High Country Stampede Rodeo is held every Saturday, July 7 to August 18 at John Work Arena one mile west of Fraser, and will take place rain or shine. The rodeo offers many special events including Family Fun Night, Cancer Awareness Night, Old West Night, First Responder Night, and Military Recognition Night. Rodeo season continues with the 106th Annual Middle Park Fair and Rodeo, Aug. 8-12. This rodeo will feature childrens games, a ranch rodeo, the 4H livestock auction, and a dance. 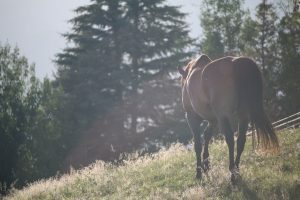 Devil’s Thumb Ranch Resort and Spa is one of Grand County ‘s oldest ranches. So it makes sense to head to Cabin Creek Stables at Devil’s Thumb Resort to ride a horse. If you are really serious about getting your western boots on, join their cattle drive. For the little cow pokes, camps are offered to teach riding skills. Sombrero Stables at Snow Mountain Ranch/YMCA of the Rockies is located in the Fraser Valley, halfway between Winter Park and Granby. They offer trail rides and wagon rides for every age group in your family. Children who aren’t ready for a full trail ride can take a lead-around pony ride. Or, visit Snow Mountain Farm where sheep and goats bleat and baa for your attention. Go into their pen and give a goat a hug! Breakfast and dinner wagon rides are a great option for those who’d rather not go horseback. All rides offer spectacular views of the Continental Divide. The experienced wranglers often share knowledge of the local wildlife. Breakfast and dinner horseback rides are also available. Experience a little bit of the Wild West on horseback at the Winding River Resort near Grand Lake. One- and two-hour rides are offered all day long along the Colorado River in Rocky Mountain National Park. 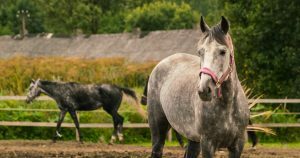 Introduce the kids to horses the easy way by doing a half hour pony ride. The horses also love to pose for pictures and get a scratch or two. Another way to have a true Western experience is take a hayride on the musical wagon to the Sasparilla Saloon, where kids will get a real taste of the Ole’ West. Bring the kids over to the Animal Farm and have them say hello to the miniature horse and burro. Also see the piglets, bunnies, chicks, baby goats and calves! If you have your own horse, you will be happy to know that horses are allowed on almost all of the trails throughout Grand County! To avoid user conflict, it is a good idea to skip the high-use trails close to town utilized by bikers and hikers. For a moderate trail in a great forest setting with light foot traffic, the Doe Creek trail is a good option. Not too far off the beaten path, the trail is located off of County Road 6, that connects to US Hwy 34. The trail offers beautiful views overlooking Lake Granby.